To drink we had a caramel milkshake – sweet but less sticky than I expected which is a good thing. Two cappuccinos were ordered (coffee drinkers from abroad who’ve tasted Taiwan’s coffee consistently tell me Taiwan makes the best cappuccinos. Don’t ask me why! 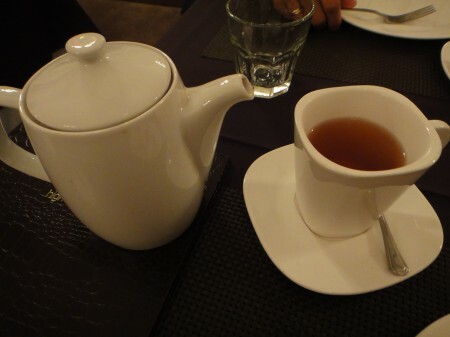 ), and an Earl Grey Himalaya (tastes just like a regular Earl Grey except with a hint of chai flavor). Like TWG, there were no tea leaves in the pot as the tea had been pre-steeped in order to provide a consistent flavor. 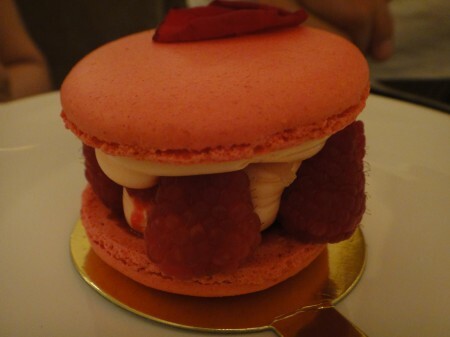 For the little desserts, we had the Ispahan, a large sized rose, raspberry and lychee macaroon. It was delicious! 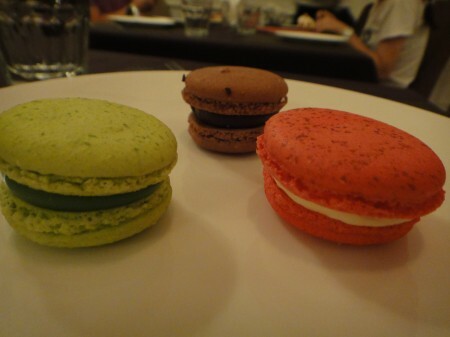 Nice because you could distinctly taste the three different fruits within the pastry.Three small macaroons were ordered: rose raspberry, chocolate and green tea passionfruit. Lastly an Earl Grey éclair with Earl Grey crèmeux, Bailey’s Chantilly and Earl Grey tea pipette was brought to the table. 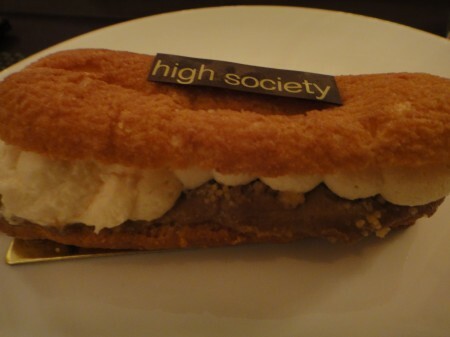 To be honest, I’m not really into éclairs – by that I mean I don’t normally order them. Nothing against them but normally nothing too exciting is every done with them, so I’ve never found a reason to go out of my way to order one. Finally, the moment came after being suggested by the waiter. While the tea flavor was there, the pastry came in its conventional form and shape, and sadly the taste wasn’t enough to fully win me over to make me a real éclair fan. That being said, this place is a sweet spot. Literally. Tags: Bailey's, Cappucino, Caramel, Chantilly, Chocolate, Dessert, Earl Grey, Eclair, Fancy, French, High Society, High Tea, Himalaya, Lunch, Macaroon, Milkshake, Moet, Raspberry, Rose, Shoppes at Marina Bay Sands, Singapore, Veuve-Cliquot.